The recent release of the Crazy Rich Asians movie has piqued global interest in Singapore as a ‘rich’ destination – not simply for its luxury experiences, but also for its diverse cultures, including a colourful culinary scene. In response to this, tour company Wok ‘n’ Stroll has crafted the Crazy Rich Asians – Behind the Scenes Food Tour. It takes guests behind the scenes of locales mentioned in the movie and its original novel, some of which include restaurants and hawker centres. Our journey started at CHIJMES, where Wok ‘n’ Stroll’s resident food guide Simon imparted tidbits about the historic chapel and how the movie’s wedding scene was filmed here. Complementing this stop was a visit to Michelin Bib Gourmand restaurant New Ubin Seafood’s newest outlet at CHIJMES. The tour also provided a glimpse into Singapore’s famous hawker culture with a stop at Lau Pa Sat’s evening market, where a row of grilled satay, oyster omelette, carrot cake and murtabak (pan-fried bread with stuffing) awaited us. The night ended with a swig of the iconic Singapore Sling, accompanied by a stunning evening view of the Marina Bay skyline at LeVeL33 Craft-Brewery Restaurant & Lounge. 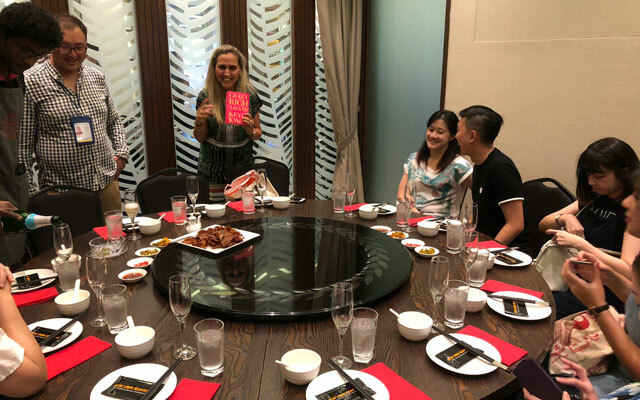 The Crazy Rich Asians – Behind the Scenes Food Tour is also available in the day with a different itinerary that features other places such as the Botanic Gardens and Keong Saik Road. As each tour is limited to a maximum of 10 pax (and a minimum of six), larger corporate groups can be split into different groups and still enjoy a lower rate per participant. The original price is S$150 (US$109) per person. The tour runs every Sunday at 18.00. Our session lasted four hours, during which we were ferried from place to place in a private mini-van. The meeting point is confirmed and disclosed after booking. In the restaurants, the best seats in the house were reserved for the tour, such as a private room and a corner table with an unobstructed panoramic view. At the evening market, a row of tables had been “choped” (local slang for “reserved”) for us with tissue packets and table mats – no mean feat in a crowded hawker spot. Food is served before or upon arrival. Wok ‘n’ Stroll’s guides, such as Simon, are closely linked to the culinary scene in Singapore, and happily share local anecdotes with participants.